A huge proposed gold mine in the Yukon-Kuskokwim Delta cleared a major hurdle on Monday, Aug. 13. 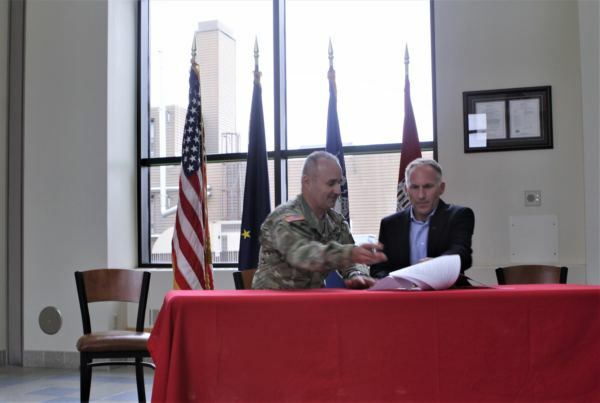 “The spirit of this joint record of decision is about everyone coming together and working together and coming up with a quicker decision,” David Hobbie, of the Army Corps of Engineers’s Alaska District, said. Hobbie and other top federal officials joined representatives from the mining industry and Native Corporations at their Anchorage office to commemorate the occasion. It took six years of environmental review, but Donlin Gold has finally received two major permits from the Army Corps and Bureau of Land Management. Donlin is trying to develop one of the biggest gold mines in the world. Because the mine will impact thousands of acres of wetlands, it needed a permit from the Army Corps. The plans also include a 315-mile-long gas pipeline, which crosses over federal land run by the Bureau of Land Management. So it needed a permit from them as well. And for two Native Corporations, the permits means the Y-K Delta could get more jobs. Andrew Guy is the CEO of the Calista Regional Native Corporation, which leased the subsurface rights to Donlin Gold. “This is one of those steps that we need in order to improve conditions we have out in the region,” Guy said. But Donlin faces growing opposition from Y-K Delta tribes. Nearly a dozen have passed anti-mine resolutions in the past two years. The tribes fear the mine would damage their subsistence lifestyle. And they fear a mine accident could contaminate the Kuskokwim River, a vital food source. The Orutsaramiut Native Council and the local working group, the Yukon Kuskokwim River Alliance, oppose the mine. They released a statement Monday saying the permitting process left out many voices from the region. But Andrew Guy says their concerns have been heard throughout the process. “We are involved in subsistence too with our own families, so that’s a very valid concern that we’ve always kept in the top of our heads,” Guy said. The gold mine needs at least one hundred permits before it can start mining. Donlin Gold says they plan to get the major ones out of the way this year. The rest of them could be completed in two years.